Curtis Free sends down a delivery in Cleckheaton's Bradford League Premier Division game with Morley last Saturday. Pictures: Paul Butterfield. 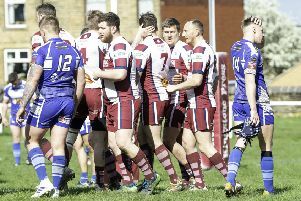 Hanging Heaton are the early pace setters in the All Rounder Bradford Premier League following victory over Woodlands last Saturday. Captain Gary Fellows hit an impressive century on the newly relaid square at Albert Terrace in an innings that included a six and 14 fours. Joe Fraser who smashed six sixes in his 56, while David Stiff’s rapid 32 not out ensured Heaton pocketed maximum batting points, reaching 250-7 in a match reduced to 40 overs per side. Scott Richardson (3-68) and spinner Kez Ahmed (3-70) were the most successful Woodlands bowlers. Woodlands lost captain Tim Jackson to an early run out before opener Sam Frankland (50), Logan Weston (42) and Alex Atkinson (36) led the recovery. Overseas player Sarfraz Ahmed — in his 16th consecutive season at Woodlands — peppered the boundary in an explosive innings of 60, which included six sixes and four fours. Woodlands lost wickets and when Sarfraz eventually fell, the home side closed on 228-8. Cleckheaton picked up their second win, beating Morley by seven wickets. New signing Chris Holliday hit an unbeaten 70 as his side chased down a modest Morley total of 155. Morley made a solid start with contributions from Richard Jubb (34) and Henry Rush (30) but then collapsed from 99-3 to 124-9 in the face of some good bowling from spinner Andrew Deegan (4-42) and swing bowler Sam Wilson (3-34). Promoted Scholes slipped to a second straight defeat at the hands of Lightcliffe. Openers Kasir Maroof (44) and Christian Jackson (34) laid a good platform for the Scholes innings, while overseas player Rizwan Ahmed made an unbeaten 54, but they were kept in check by left-arm spinner Suleman Khan (5-29) and closed on 166-7. Opener Chris Taylor made an unbeaten 76 and was aided by Rob Burton (39no) as Lightcliffe reached their target with 16 balls to spare and five wickets in hand to pick up their first win. East Bierley slipped to a second straight defeat, losing by seven wickets against Bradford and Bingley in a match reduced to 20 overs a side. Although Fahid Rehman made 37 for Bierley, they were restricted to 111-7 as Bingley’s overseas player Noman Aliclaimed 3-37. Ali then blazed 58 from just 31 balls, including four sixes and seven fours to see his side to victory with 13 balls to spare. Champions Pudsey St Lawrence picked up a second win as they posted 158-4 in 20 overs against Farsley, who were restricted to 125-7 in reply, while there was no play between Pudsey Congs and New Farnley due to the wet outfield.